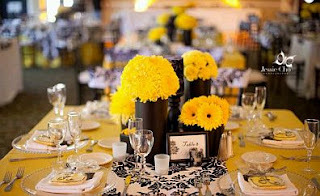 Already have decided, you want to break the tradition of black and yellow to risk using as the characteristic of your wedding, the idea is original and very good, and certainly, when you see the results you will not regret having made ​​that decision. 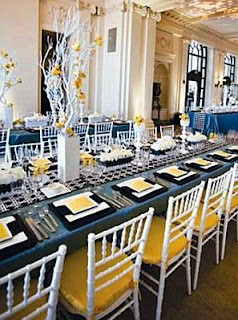 To give you some ideas on yellow centerpieces and floral arrangements , then we present a series of images that surely will help in the delicate task of choosing the best for your celebration. In this first arrangement have a series of coves or water lilies, also called cartridges, which placed yellow following the round shape of the vase, are extremely romantic. 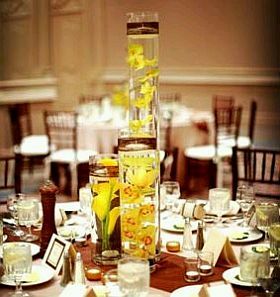 Another idea if you're looking for submerged flower arrangements, especially in this you have three containers of different sizes, with different types of yellow flowers inside. 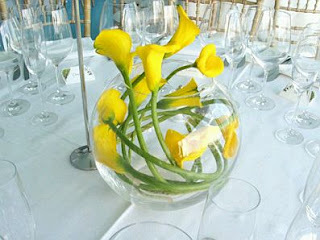 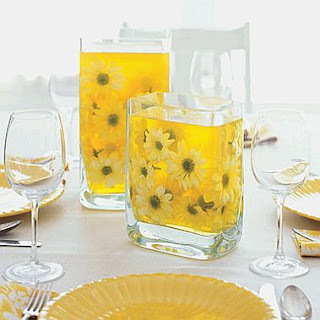 Another beautiful proposal with yellow daisies dipped in glass filled with water of the same color. On the other hand if you prefer to use branches here are some interesting proposals. 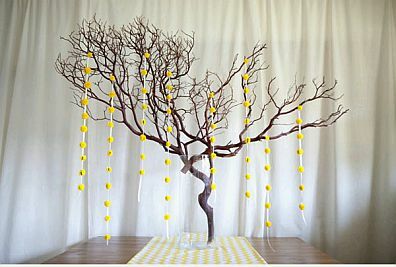 This first branch consists of the dried natural yellow beads hanging joined together. If on the other hand you plan something more rustic, this centerpiece can be the one. 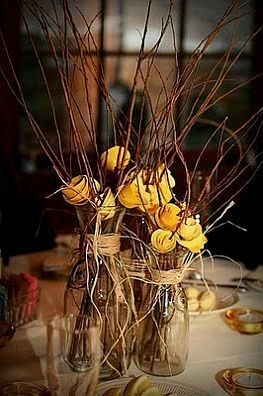 But if you prefer to combine yellow with white, these natural branches, dried and painted this color can look good in your decor, as you note, has applications in yellow. 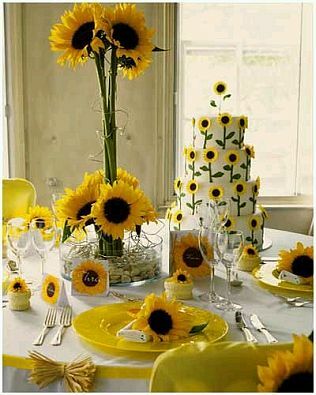 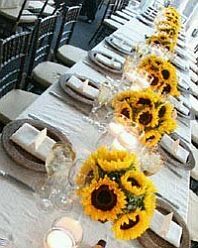 One of the favorite flowers when they think of yellow floral arrangements are sunflowers, is why we present some interesting proposals in this first image you have a very low arrangement of sunflowers supplemented with candles. 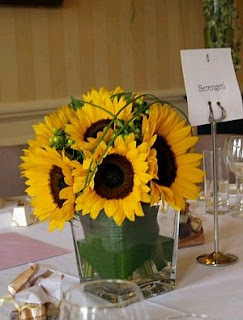 If you want a flower arrangement of sunflowers with a little more height this centerpiece might be useful. If you are planning a wedding or outdoor setting, this simple but beautiful bouquet of flowers highlighting the sunflowers, is an excellent choice. 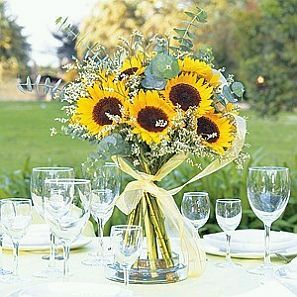 But if what you wanted was a tall arrangement of sunflowers, here we present it. 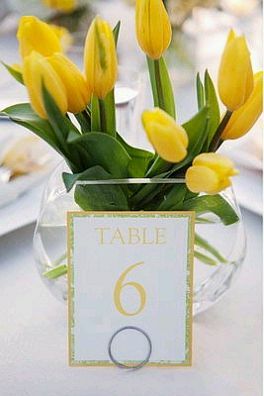 There are other beautiful flowers arrangements you can get impressive displays of them are these yellow tulips. 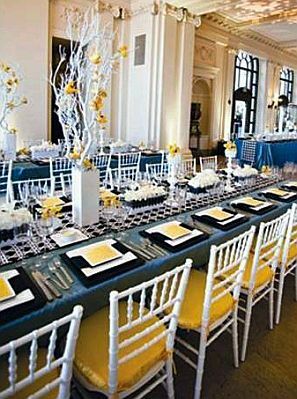 Finally, everything is properly combined with floral arrangements or centerpieces with the rest of the decor, as seen in this picture.